Shown below is an enlarged extract of the Will showing George's signature and details of the two people who witnessed it. The first named is John Kemeys Bateman, a licensed victualler of Colchester. 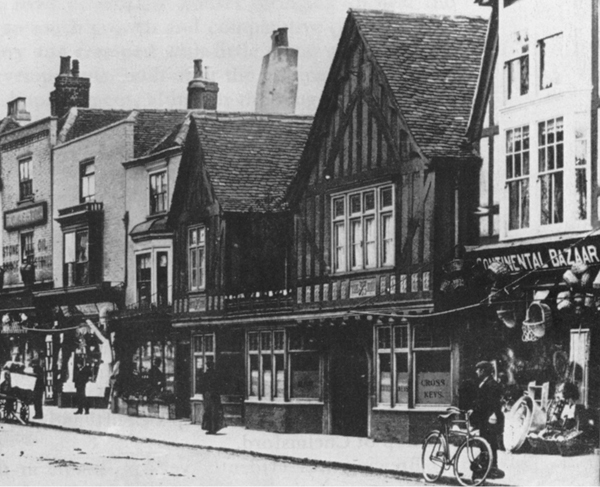 We believe he was a friend of George as previously in 1894 he was Landlord of the Cross Keys public house in Chelmsford (photo left). He died aged 49 in Biggleswade in 1905. The second witness named was Percy Ward, clerk to solicitors William Tanner of Chelmsford who had represented George many times over the last ten years.